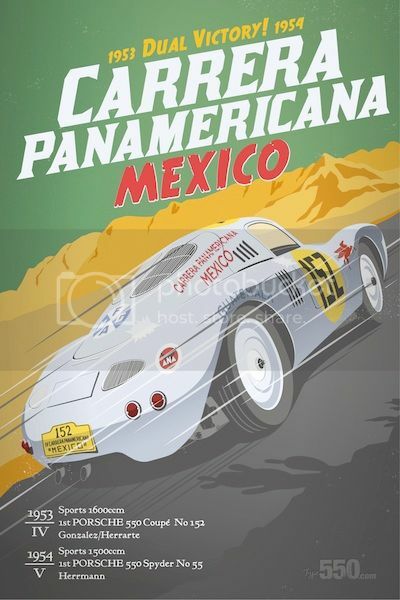 Show me your Porsche Art..
Re: Show me your Porsche Art.. I picked up this pencil etching at a gallery on Camano Is., WA. I love the first one. Used to draw those in high school and college, but nowhere to that level. Very cool! Here is a 1950's oil painting of a black 356 coupe. Very sharp detail and looks to have been painted around the same time as the car was built. What is unusual is that the fender tag on the drivers side is round? I have never seen a round one before. 1961 356B T5 Karmann Hardtop #200279 Sports Coupe named "Carmine"
3' x 5' Oil Painting by Ruel James I commissioned at a PCA charity auction. Last edited by Randy Kaplin on Mon Jan 19, 2015 4:29 pm, edited 1 time in total. Tag: It’s only a hobby. First edition 9 of 73. Last edited by Alex Mestas on Sun Mar 31, 2019 3:19 pm, edited 1 time in total. 1963 356 T-6 Coupe Signal Red. 1973.5 911 T Coupe Ivory. 1989 911 Carrera Targa Grd Prix White. The Cleaworth is an artists proof for what ever that's worth, 1988 ECH poster, but my two favorites? Roy Hoeffleurs's orange speedster. He just came by and dropped it off one day. "I don't know if you even like it , but it reminded me of you." Sheeit, I damn near weeped. The Road America shot was done by Ron Nelson. 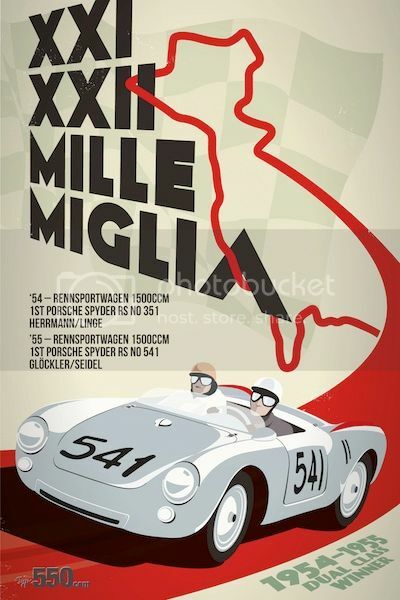 Fantastic photographer of 50's and 60's motorsport. I have more to post. Sorry for the bounce back in the pics. Is that Ferry and Ferdinand standing behind the Mobilgas sign, good addition, and your car turned out awesome, gives us motivation! Here is a painting by a Seattle artist that I purchased years ago. 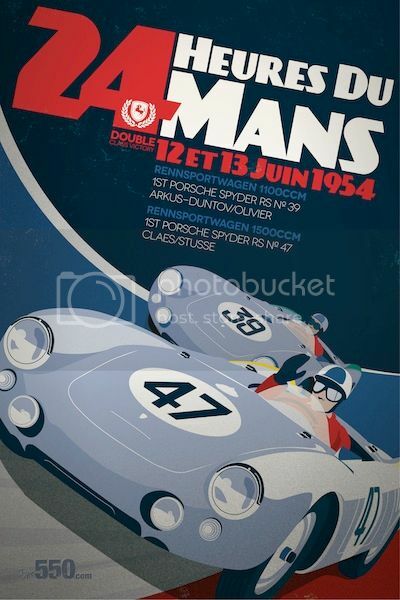 I received permission from Porsche and the Artist to make posters from the painting, but never got around to it. Barn Find. Water color 11 1/2 x 15" . If you want your Porsche painted, I'm taking commissions. My son Derek is 21 now but has been a 356 enthusiast for some time now. Here is wall art he drew when he was around seven years old. His Little League number was seven so that's the number all the cars got. The 911 Carerra RS is half train/half car 'cause he drew a lot of trains at that time too. I especially liked the bumps in the road to meet the wheels on the cars. 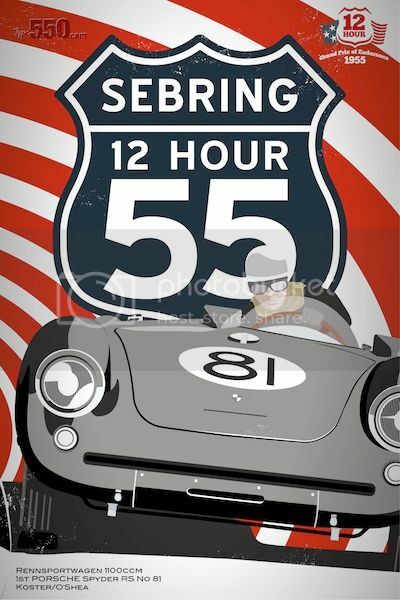 Since this drawing on Fathers Day and Birthdays I request a homemade card that includes a 356 with "bumps in the road". The pic is of the Porsche artist grown up and at Dana Point July 2014. True Art. That's a keeper! Very cool.